Fluid: Red Gauge Oil Sp.Gr 0.823. We are offering Acrylic Body Manometer to our clients. Advanced Technocracy Inc. is Manufacturer, Exporter & Supplier of Manometer. Acrylic Body Reading Manometers are fabricated from 1 inch. Thick acrylic plastic solid block, virtually unbreakable stable and free of distortion. 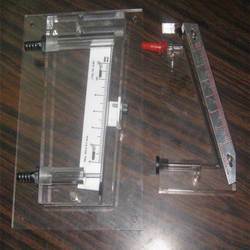 PVC plastic engraved scale, zero adjusting knob and panel mounting holes provided with manometer. We are instrumental in providing our customers with an exclusive range of Hand Held Digital Pressure Manometer. Widely appreciated for their features like auto zero function, selectable pressure unit, peak hold mode and excellent accuracy, our products are known to serve as digital pressure calibrators based on microprocessors. 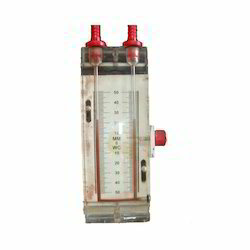 “FLOWTECH make U-Tube manometer is used for precision measurement of pressure, vaccum, differential pressure, and flow measurement in plants & labs where certain accuracy is required. We are the Leading Supplier of Digital Manometer.